Channel 10's Mel McLaughlin interviews cricketer Chris Gayle. NEXT month is Chinese Lunar New Year, the year of the monkey, which is funny because going by the news this past week you’d swear 2016 was the year of the pig. The chauvinist pig, to be precise. Yes, just one week in and we’ve already seen enough examples of boorish, blokey behaviour to last us at least until the resumption of footy season. We started off strongly on January 1 with a nationwide discussion about whether disgraced former minister Jamie Briggs’s behaviour towards a female public servant in a Hong Kong bar constituted sexual harassment, or whether he was just a top bloke doing what top blokes do. I mean, he only kissed her on the cheek! Unless it was the neck. But the bar was crowded! And she posed for a selfie! And she sent his chief of staff a text message the next day — using exclamation marks! Clearly she couldn’t have been that upset, lighten up it’s just a bit of flirting, men will be men etc, etc. Then on January 2 a photo of the woman in question wound up all over the media, no thanks to Briggs who later admitted he’d sent a copy to his mates. One can only wonder why. Oddly, this was at the exact same time as he valiantly told the media he wouldn’t publicly reveal her name to “protect her privacy”. What a top bloke. Not to be outdone in the drongo stakes, on January 3 Immigration Minister Peter Dutton stole the spotlight for accidentally texting Daily Telegraph journalist Samantha Maiden calling her a “mad f**king witch”. The message was meant for Briggs, he later explained. A heartfelt message of support, from one top bloke to another, I suppose. 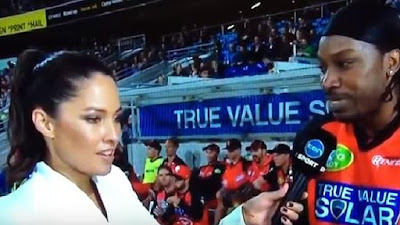 We were on a roll by January 4, when West Indies cricketer Chris Gayle sleazed on to Channel 10 sports reporter Mel McLaughlin live on air during a post-match interview, asking her out for a drink and calling her “baby”, like some sort of gross human manifestation of Pepe Le Pew. The only thing more disrespectful than Gayle’s lame pick-up lines were the great guffaws of laughter coming from the blokes in the commentary box, who clearly thought the objectification of their female colleague was hilarious. Until they realised no one else was laughing, at which point they went all po-faced and apologised for the cricketer’s behaviour on behalf of the network. Gayle has been widely condemned for all of this, but also, predictably, widely celebrated by a vocal group of fans who claim he’s being misrepresented. He’s a top bloke, doing what top blokes do, lighten up it’s just a bit of flirting, men will be men etc. etc. Sound familiar? These misguided fools have started the hashtag #StandByGayle and taken to the MCG with protest signs, as if Gayle is some sort of political hero and not just an over-inflated knob with no respect for personal boundaries. This year has brought other maddening examples of sexism, too: the heroine of the new Star Wars film being mysteriously omitted from spin-off merchandise; a nationally televised poll on whether women on welfare should have their reproductive rights taken away; and Barry Humphries claiming transgender women aren’t real women, which is quite ironic coming from a bloke who prances about in dresses for a living. But it’s the sorry tales of Briggs, Dutton and Gayle, and the support they’ve generated in some sections of the community, that make me despair for gender equality. Because it’s quite clear that no matter how obvious their transgressions against women, so many men just don’t get it. First published by The Advertiser, January 9, 2016. CLICK HERE to read the original article.